A colourful global story in the vein of Slumdog Millionaire, A Million Colours was inspired by a true life story – that of Muntu Ndebele and Norman Knox (the black and white stars, respectively, of the 1976 film classic e’Lollipop – one of South Africa’s biggest box-office hits which was viewed in more than 40 countries). A Million Colours now tells the story of what happened to these child stars during the past 30 plus years. Actor Wandile Molebatsi portrays Muntu Ndebele, while Idols winner Jason Hartman was cast in the role of Norman Knox. The producer and co-writer of e’Lollipop, André Pieterse, called in the assistance of Knox to find Ndebele, who disappeared without a trace for two decades. Ndebele’s sister (Lindi) eventually informed them that he did not want to be found. He was embarrassed as he fell into disrepair due to a life of drugs and crime. When found amongst other addicts in Hillbrow, as a 39-year-old, he weighed only 42kg. During three years of rehabilitation, Pieterse encouraged Ndebele to write his life story on a daily basis. For three years he wrote every day, followed by a monthly letter to “uncle André” to keep him in the loop of what was going on in his life. 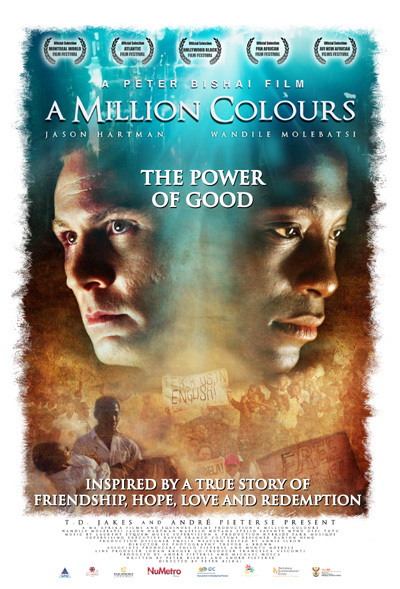 A Million Colours tells the story of true love and friendship that gets challenged in every way imaginable. It showcases how love triumphs over evil and how God in his wisdom and grace grants Ndebele a second chance in a life impacted by wrong choices. “It is a tour de force of intriguing characters, ripping dialogue, spine-tingling circumstance, dramatic depths, and exhilarating heights as the main characters find their way into a hopeful future by honouring and uplifting those who sacrificed lives and loved ones with an unprecedented determination to respond to a second chance,” said the award-winning Canadian born Director and co-writer of A Million Colours - Peter Bishai. © 2012 MA-AFRIKA FILMS (PTY) LTD. All rights reserved.